THOMAS JEFFERSON. Autograph Letter Signed, to James Mease. With conjoined franked address leaf in Jefferson’s hand. August 17, 1816. Monticello, [Charlottesville, Va.]. 1 p., 9¾ x 8 in. When we are pouring our inmost thoughts into the bosom of a friend, we lose sight of the world, we see ourselves only in confabulation with another self; we are off our guard; write hastily; hazard thoughts of the first impression; yield to momentary excitement; because, if we err, no harm is done; it is to a friend we have committed ourselves, who knows us, who will not betray us; but will keep to himself what, but for this confidence, we should reconsider, weigh, correct, perhaps reject, on the more mature reflections and dictates of our reason. to fasten a man down to all his unreflected expressions, and to publish him to the world in that as his serious & settled form, is a surprise on his judgment and character. I do not mean an inference that there is anything of this character in Doctor Rush’s letters to me: but only that, having been written without intention or preparation for publication, I do not think it within the office of a friend to give them a publicity which he probably did not contemplate. Jefferson’s own attitude toward a higher being was complex and deeply considered. While he rejected much of Christian doctrine, he embraced the moral teachings ascribed to Christ. 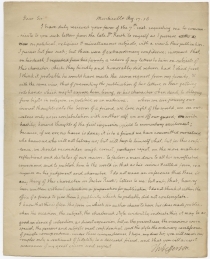 Writing to Rush in 1803, Jefferson stated simply, “I am a Christian, in the only sense in which he wished any one to be; sincerely attached to his doctrines, in preference to all others; ascribing to himself every human excellence; and believing he never claimed any other” (Jefferson to Rush, April 21, 1803). Jefferson considered the supernatural aspects of worship as incompatible with reason and deeply distrusted the interference of religious leaders in civic matters. 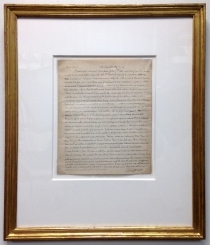 In the letter offered here, Jefferson mentions religion as the first topic that could expose a writer to “obloquy” (abusively detractive language or utterances). Throughout his presidency, Jefferson had been attacked as an infidel and atheist for his deistic worldview. To Jefferson, the attacks represented the baneful influence of orthodoxy, and he sought to shield his friend’s legacy from similar, posthumous attacks. James Mease (1771-1846) studied medicine under Benjamin Rush and was a prominent Philadelphia doctor and scientific thinker. He helped develop a scientific vineyard, was a member and curator of the American Philosophical Society, and was a founder and the first vice president of the Philadelphia Athenaeum. He served as a surgeon during the War of 1812. 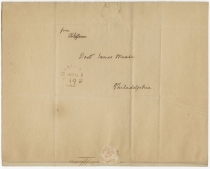 He devoted considerable time to correspondence among other scientifically minded individuals around the United States and the world on subjects of horticulture, geology, penal and criminal reform, technology, and medicine. He wrote a book, The Picture of Philadelphia, Giving an Account of its Origin, Increase, and Improvements in Arts, Sciences, Manufactures, Commerce and Revenue (1811), that charted the city and its inhabitants’ rise to prominence in American life.